I'm not sure what I was expecting from "Letters From the Big Man" tonight, but it certainly wasn't the movie I got.The new film from writer-director Christopher Munch -- he made an arthouse splash back in 1991 with the speculative John Lennon film "The Hours and Times" and followed that up with 2001's "The Sleepy Time Gal" -- was being talked up as sort of a Sasquatch romance, maybe something along the lines of a gender-reversed version of R. Crumb's infamous underground comic "Whiteman Meets Bigfoot." Instead, it's a willfully naive poetic reverie about lost souls trying to get close to nature in the Pacific Northwest and about the giant man-beasts who watch over them -- and, by extension, us -- like hairy angels. The star is Lily Rabe (daughter of the late Jill Clayburgh and playwright David Rabe); she plays an Amazonian US Forestry Dept. surveyor who finds her deepest peace camping out in the backcountry. Munch's film touches on many things, including the logging/preservation debate (the director finds room for the people on both sides), idealism, young lust, CIA advanced-weaponry programs, and Native American animism. 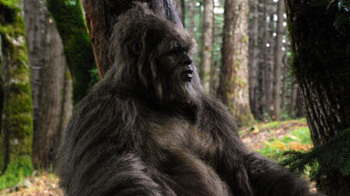 It's woolly-headed, weirdly moving, and occasionally laughable, and the scenes in which a startlingly realistic Bigfoot moves gracefully into the heroine's field of view count for all three.Think a genetic recombination of "Harry and the Hendersons" and "Wings of Desire," and, whether you like the film or not, admire Munch for going so far out on his chosen sequioa limb. "Letters From the Big Man" is probably too odd to get picked up for theatrical release, but there's magic and foolhardiness here in equal measure. Munch truly believes, by the way, that the big fellas are out there and have many things to teach us -- but he dodged the post-screening question of whether he himself had seen one. Speaking of unexpected genetic mutations, "The Convincer" calls to mind a fusion of "Fargo" and "The Usual Suspects," an interesting conceit that develops engine trouble midway through. Directed by Jill Sprecher ("Clockwatchers"), the movie features an echt Sundance cast: Greg Kinnear, Alan Arkin, Billy Crudup. The problem is that there's no one to like in the entire movie, starting with Kinnear's greedy, mean-spirited Midwestern insurance broker, a cad who's an equal-opportunity offender. The character comes across a valuable violin in the house of old codger Arkin and sets up a complicated scam that just as complicatedly comes undone. At times, "Convincer" plays like a live-action Road Runner cartoon, and it bumps along with pleasant nastiness until Crudup turns up as a psychotic locksmith, at which point the tone darkens radically and blood gets spilt. Some twisty last-minute plotting almost saves the movie, but by that point your interest and patience have been frittered away. It's a classic high-end Sundance feature from its players to its jokey, shallow nihililsm. Another film that sticks closely to established Sundance tropes is "My Idiot Brother," which Weinstein snapped up for $7 million in one of the week's big buys. That makes sense -- it's the kind of movie that Harvey would have bought in 1997, so why not now? Paul Rudd goes hairy and happy as the title character, a crunchy goofball so naive he sells pot to a uniformed cop because the guy asks nicely. Once out of jail, he bounces among the homes of his three sisters, played by Elizabeth Banks (uptight Vanity Fair writer), Emily Mortimer (mousy Brooklyn mom), and Zooey Deschanel (downtown sort-of lesbian), and reduces their various lives to ruin. Jesse Peretz directs with an eye toward forced situations and glib, two-note characters that sometimes don't work (has Rashida Jones, as Deschanel's girlfriend, ever met an actual lesbian?) and sometimes, surprisingly, do (the scenes between Rudd and T.J. Miller are pure stoner Abbott and Costello). Overall, the film is very much like its dazed and confused hero: an adorable mess. Will it make Weinstein back its money? Probably; Rudd's worth a decent opening weekend at this point, and it'll be easy to market "Brother" as the Judd Apatow movie it's not. But the sale fuels the sense that there are two Sundances going on this year, one pointed contentedly toward the past and one aiming more quietly and firmly at the future. I hope to see more of the latter today.